A lone motorcycle sits atop a parking garage in Rutland during the second annual Road Pitch, where a group of motorcycle-riding investors and entrepreneurs tour the state to get pitched by budding businesses looking for money, advice and connections. Politicians and government officials talk a lot about improving Vermont’s economy. But both politically and financially, there are limits to what the public sector can do. Now, for the second year in a row, a group of motorcycle-riding investors and entrepreneurs has set out across the state to pitch in. It's becoming tradition in Vermont: The first week of August, riders tour through the most promising hubs in the state, stopping twice a day to get pitched by budding businesses looking for money, advice and connections. The riders — about 45 this year — are looking to invest, help out, have fun, and stay out of the rain. Event organizer Cairn Cross says the Road Pitch, as it’s called, is a form of economic development for which the private sector is uniquely positioned. Cross says Road Pitch is effective because it simply gets new and experienced entrepreneurs talking. Aside from the loud engines, helmets and leather or Gore-Tex gear, this is hardly a new concept. It’s networking. Bob Bloch, an entrepreneur, investor and business professor, says it’s what drives economies everywhere. And this year’s Road Pitch brought riders to some areas that could use more of it: Riders stopped first in Essex and Bennington, followed by Brattleboro and Rutland, then Randolph and Lowell. They wrapped up with stops in Morrisville and Grand Isle. In Bennington, local organizer Brian McKenna says the Young Professionals chapter there has been striving to get the kind of attention that rolled into town recently. Road Pitch riders cozy up in Rutland to hear from three entrepreneurs - all women, including one college senior. Organizer Cairn Cross says Road Pitch is effective because it simply gets new and experienced entrepreneurs talking. Cairn Cross says his goal in encouraging a “startup ecosystem” is just that: to create opportunities for people with resources to interact with people who need them. “If you connect those resources together over time, things will happen,” he says. But the long gestation period inherent in this approach, the riskiness of startups and the disruptive potential of entrepreneurialism — these can be hard sells for politicians and public officials with multiple constituencies to answer to, with taxpayers dollars to be accountable for, with results to show to for the next election. Cross says he thinks government approaches economic development with “blunt instruments” when it looks only to tax incentives and streamlining regulation. 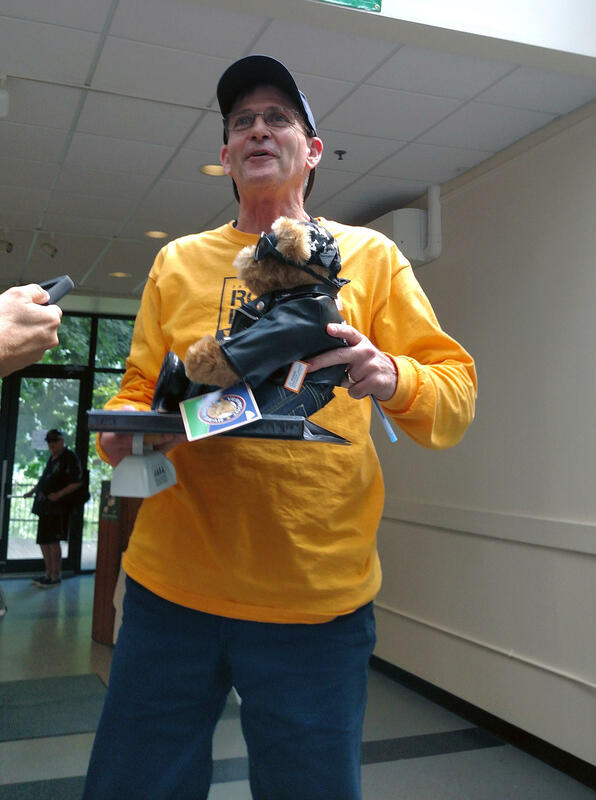 Road Pitch organizer Cairn Cross displays a custom-outfitted Vermont Teddy Bear, given with $450 to the winning business after riders critique and rate the pitches in each location. Many businesses pitching Road Pitch riders last week did ask for money. But all of them wanted advice about the rest of those things that go into business. And they got it, through informal question-and-answer sessions after each pitch. There was a bit of bluster among some riders when they talked amongst themselves over meals or drinks in the evenings. But, the pitch atmosphere stayed wholly positive: more casual and helpful, less formal or critical than traditional pitch sessions. The goal was just to make good ideas better. Dana Wilkinson, founder of a clothing line called The Dirty Old Biker, says it’s a supportiveness he finds pervasive in Vermont. Cross says he doesn’t think Vermont’s startup ecosystem has reached full steam yet, but over time and with the ripple effect from events like Road Pitch, he says it will get there. This spring, the Legislature set a goal of improving the economy of southern Vermont. Last week, a special committee met to discuss how to make that goal a reality. Lawmakers created a special economic zone covering the state’s two southernmost counties – Bennington and Windham, along with parts of Windsor county. Keurig Green Mountain says it remains committed to its Vermont operations, despite cutting 200 jobs at its Waterbury facility. The total number of jobs eliminated at Keurig operations throughout North America was 330, or five percent of its workforce. In Vermont the figure was closer to nine percent of the company's overall workforce, so the state took a disproportionate hit. The nation’s largest residential solar company is opening a Vermont branch. SolarCity uses a business model it hopes will attract customers who might not have considered going solar. The green expanse in front of the Statehouse in Montpelier could be considered Vermont's front yard — a gathering place for everything from political protests to ultimate Frisbee contests. The broad lawn was transformed Tuesday into an open air market with fresh food, handmade furniture and farm products for sale.